Kent Island Beach House II: A Fisherman's Village right in Kentmorr is not only a great place for the bride or groom's family to stay during that local Kent Island or Annapolis destination wedding, but a great place for a small company strategy session, retreat, or a central location for you to see what MD, DC, and VA have to offer. Location! BAYcation! STAYcation! This 2-story family friendly spacious home is on the corner lot across from Kentmorr Restaurant with the Marina to the left of the home, KI Beach House to the right, and the Chesapeake Bay out the deck side. We are located on Kent Island just minutes from Kent Narrows in Stevensville MD. Come by Car, Boat, or Plane! 4+ Bedrooms, 2 Full Baths, Kitchen, Living Room with big flat screen TV, Sitting Room, Dining Room with big flat screen TV and a Picturesque Panoramic View of Kentmorr Marina and the Chesapeake Bay that will allow your mind to float away. (sleeps 10-12 adults comfortably). Perfect any time of year; great for those born to fish, shop, get married at one of the local venues, visit the Naval Academy, or work if your must. All of the conveniences you want at your fingertips and a luxury waterfront view too. What a retreat! Look us up on UTUBE "Kent Island Beach House"
Stay at one of our KI Beach Houses on Kent Island in Stevensville and enjoy a week or a weekend of fun on Kent Island, or in Annapolis, Easton, St Michaels, Chestertown, Baltimore and Washington DC. Book your accommodations with us now for there is lots to see and do. Book your fishing charter, a round of golf, setup a winery tour, explore Kent Island, day trip to Annapolis or DC's National Harbor, shop till you drop, and more! Call Donna today! Please note that last minute 2 night specials may not be available during holidays and special events. Visit Kent Island in MD. Get your group out of the office for a team build, meetup with friends, or take your family on vacation. Setup your Tee/Tea Time, arrange a wine tasting. Take a fishing charter, Bay Bridge Cruise, or kayak tour. Do some chicken necking, take a Bay Bridge fly over, or just enjoy the seafood restaurants and beaches. Don't forget to ask us about our Chesapeake Bay Bridge, Annapolis, or Lighthouse Cruises. United States Naval Academy (USNA) Graduation – Our proximity to the sailing capital of the world-Annapolis makes us a prime accommodation for your friends and family for Commissioning week or any time of year to visit your midshipmen. Now booking for I-Day, Ring Dance Weekend, Commissioning Week, and Commissioning/Memorial Day Weekend 2019 and 2020! Tying the Knot…Spend a weekend at KI Beach House II to investigate the wedding venues on Kent Island. We have had guests stay with us who planned their wedding/reception at such places as Kentmorr, Silver Swan, Matapeake, Chesapeake Bay Beach Club, Kent Manor Inn, Kent Narrows, Bridges, Prospect Bay, Ram's Head and more. Our short term rentals are conveniently located in Stevensville MD close to all the destination wedding, golfing, fishing, restaurant and shopping hotspots. Let us know what you need and how many you are trying to sleep. Our rates are for up to 12 people. Book a fishing charter, take a boat ride, enjoy the local fireworks, gaze at the Navy's Flight Demonstration Squadron of Blue Angels, watch the large ships cruise by, walk across the street to the Kentmorr Restaurant, Marina, swimming beach and/or tiki bar, catch a game of golf, take a stroll/bike ride on Kent Island Trail, venture out to the local wineries, book a fishing charter, or just stay put read your favorite book and enjoy the Kentmorr Marina, Restaurant, and the Chesapeake Bay. Come stay with us today and relax on our deck, Kentmorr or Matapeake beach, or in the house while watching the sun set on the Chesapeake Bay! 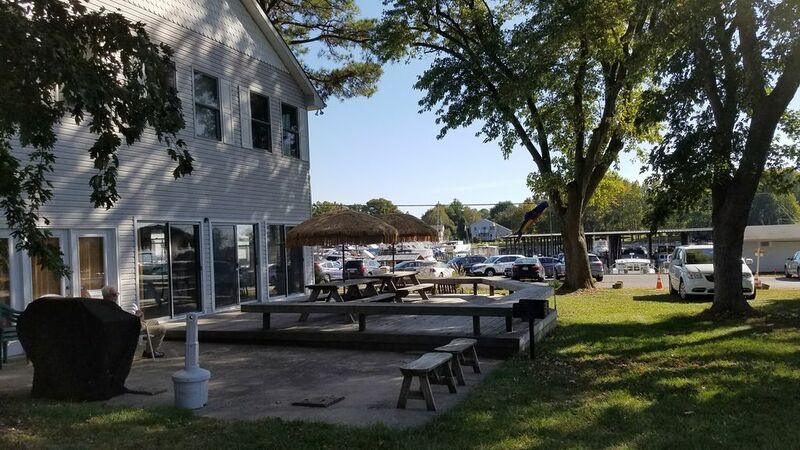 Kent Island Beach House II: A Fisherman's Village right in Kentmorr is just steps away from Kentmorr Restaurant, Tiki Bar, Beach, Marina, and Airpark. Just minutes from Queen Anne’s Silver Swan, Blue Heron Golf Course, Chesapeake Bay Beach Club, Matapeake Park, Romancoke Fishing Pier, Hemingway’s, the Yacht Club, Prospect Bay, Kent Narrows, Queenstown Outlets, Queenstown Harbor Golf Course, KI Elks, KI American Legion, and more. 20 minutes to Annapolis, 30 minutes to Baltimore, less than 45 minutes to DC, and 2 hours to Ocean City. Keywords: chesapeake bay, eastern shore, kent narrows, rental, stevensville, paradise, wedding, beach, marina, airpark, fishing charter, cruise, fireworks, naval academy, yacht club, dreams, swimming, walking, biking, wildlife, water, trail, golf, new tropical landscaping, private beach volleyball court, kent island, tiki bar, local wineries, shopping, outlets, consignment shops. Hi, I'm Donna and I have lived here on Kent Island since 1999 and I still brag about being on the "right" side of the Chesapeake Bay Bridge. As property managers, we manage our homes only and you can rest assured that they allow you the full Chesapeake Bay day tripper, weekender, week, or longer experience for your family, friends, group, employees, clients, or executives close to Golf, Fishing, Beaches, Boating, Bars/Restaurants/Inns, Shopping/Consignment Shops/Outlets, Wedding Hotspots, Art, the US Naval Academy, and more. Our guests constantly tell us our homes are better than the pictures! Location! BAYcation! STAYcation! All 3 of our modern homes sleep 10-12 and are located in Queen Anne’s County on Kent Island in the town of Stevensville MD just minutes from Kent Narrows, Chester, and Queenstown. We take great pride in sharing our home(s) with you and know that our customers are the heart of our business. It is utmost important to us that you are satisfied during your stay and we always encourage our guests to let us know what we can do better to earn return business. Escape to Kent Island today for it is Maryland's gateway to the Eastern Shore and our accommodations are a shore thing! Live, Work, and Play like the Locals. That’s how are story started and we are sticking to it! Check out our Utube “Kent Island Beach House” video to help you pick out your favorite vacation rental home. Kent Island Beach House II: A Fisherman's Village right in the Waterfront The The Kentmorr Waterfront Community is the place to live, work, and stay & play! Weekend/Weekly Short-term Rental with large private yard perfect for corn hole, football, whiffle ball and more within walking distance to a seafood restaurant, marina, and tiki bar. Golf is close by too. Sleeps 12. Life is a beach here at Kent Island Beach House for vacationers and locals alike. Right next door to our KI Beach House and right across from Kentmorr Restaurant and Tiki Bar. Why this Property? Location. BAYcation. STAYcation. Life is too short to not book today. Give us a call! The view is something that a Google map just can't do justice. A fisherman's dream come true and his wife too! Imagine a modern roomy 2-story home with your own private deck on the corner of the marina, restaurant, and Chesapeake Bay! Park for FREE and walk to your charter boat! Friends say it might be our best home yet and consider it an all inclusive STAYcation on the bay! Watch the fishing boats, cruise ships, and the freighters waiting to get into Baltimore. It is fantastic to have a choice to prepare a fresh rockfish in the oven, cook up some steaks on the charcoal or gas grill, steam some crabs, shuck some oysters, or just walk over to Kentmorr for some happy hour goodies or a fantastic dinner. Great setup for entertaining inside or out or just relaxing in the tub with a bottle of local wine. Home is about 2200 sq ft and the property is more than 20000 sq ft. Lots of room inside and out. toilet, tub, shower, Soak in the tub and enjoy the expansive Chesapeake views. Panoramic Chesapeake Bay views here with the Marina on one side and homes along the bay on the other side. Walk across the street to the Restaurant, Tiki Bar, and swimming beach. Panoramic views of the Chesapeake Bay and Marina from inside and out. Water Access-Swimming beach across the street in front of Kentmorr Restaurant and Tiki Bar with a gorgeous Bay Bridge View! All new Central HVAC. Separate unit for upstairs and downstairs. FREE WiFi and Internet Smart TVs in the living room and dining room. Extra towels in each bath and in the laundry room area. We don't have a fitness room but the large is yard and ready for football, whiffleball, or corn hole. Local nearby gyms do have drop in fees. 2 refrigerators in this home. Icemaker in one or bagged ice available at the Marina. Brand new appliances in 2017. Smooth cook top. Mr Coffee drip style coffee maker and filters for your use. Fully stocked kitchen ready for the chef or family get-together. Bring your paper and plastic items. Awesome open layout great for entertaining and viewing the Chesapeake Bay from inside or out. Fully stocked and all new appliances. "Foodies" love it here! FREE WiFi and Internet TVs in the living room and dining room. Dining room table could be used as business meeting space with the TV as your monitor. TV in upstairs Master bedroom. Enjoy our Cookbooks and books for your reading pleasure. Mostly games although the kids love our fish pillows. Check out the Chesapeake Bay Environmental Center (CBEC) for kayak tours. With 3 nights or more stay. Ask about Captain Bob's boat tours Put your boat in at Matapeake State Park or a local landing. Check with Kentmorr Marina for pricing if you want to tie your boat up there. Local Fishing charters. Just an awesome experience living by the marina. Imagine sipping on your first cup of coffee and watching the charter boats head out for the morning. A tennis court is only a few miles up the road. The Blue Heron Public Golf Course and Driving Range is only a mile away. Many nearby courses. Our group of friends stay together every Labor Day. Most of the time it is an Eastern Shore trip. So many great memories made in this area. We had a wonderful time at the Kent Island Beach House II! A group of 11 of us traveled out for a weekend getaway near the water and this house was the perfect location. You can see the water from the back porch and can go for a swim and a drink across the street at Kentmorr. The kitchen was well stocked for an epic dinner that we cooked one night and the hammock in the back yard was definitely a fan favorite of the weekend. Donna was very responsive and helpful. Would definitely recommend to anyone looking for a relaxing vacation. Perfect location next to a Restaurant, Bar & Marina- but you don't event have to leave your property to sit outside and have a beer and enjoy life! Location, location, location -- wonderful beach getaway! What a wonderful place to vacation -- steps from the marina, beach, tiki bar and seafood dock restaurant. The house's huge deck overlooks all of this and more, with views of the Chesapeake Bay. The spacious house has everything anyone would need, or could even think of needing, while there. The Harringtons are so attentive to anything that may arise, always willing to lend a hand. Parking is ample, privacy is abundant, and the fun is unbelievable. The beach house is perfectly suited to relax, enjoy, and vacation in style. I had six overflow house guest from out of town attending a milestone birthday celebration, I needed extra beds so I booked the beach house. It was perfection, clean, relaxing and spacious. My guests staying there were from California, Oregon and Washington they loved the views across the Chesapeake bay. Some Guests enjoyed walking the neighborhood, marina and beach followed by a drink at the local tiki bar. I would absolutely use this vacation property again! to continue providing great accommodations to awesome guests like you and yours. Thanks again! Great Locations! Clean, spacious and well equipped. Our extended family was on Kent Island for a wedding. We rented the KI Beach House II and the Golf House. Both properties were clean and very well equipped. The beds were super comfortable. Tons of extra pillows and blankets available. Beach House II is directly across the street from a Tiki Bar and private Bay beach and the Golf House is less than a mile away. The wifi worked great as cell reception is spotty in the area. All in all we could not have been happier or more satisfied. The Beach House II is laid out a little weirdly but still very conducive to family time. Thanks Kristin for renting our homes. So happy our KI Beach House II and KI Golf House homes worked out for your group and allowed you to spend time with your family at such a very special time for your daughter. It is such a pleasure to host families that appreciate our home as their home away from home and take care of it as such. Kent Island is not just a place to pass through on your way to Ocean City MD. Now it is a destination hotspot for weddings, vacations, and holiday family get-to-gathers. We have convenient Airports, Antiquing, Barber shop/Beauty shop/Massage, Basketball Courts, Beaches, Bike Trails, Biking, Charter Boats, Booze Cruises, Island Tours, Lighthouse Tours, Movie Theaters, Corn Hole, Ferries, Fishing/Fishing Piers, Fitness Center/Gym, Golf, Hiking, Horseback Riding, Horseshoes, Hunting, Jet Skiing, Kayaking, Local Wineries, Live Theatre, Marathons, Miniature golf, Museums, Parasailing, Parks, Places of Worship, Private clubs – Elks Lodge, American Legion, Moose, VFW, Racquetball, Rafting, Restaurants and bars, Sailing, Shelling, Shopping – specialty stores/consignment shops/outlet malls, Shuffleboard, Sightseeing, Swimming, Taxi, Tennis, Theme/Amusement Parks, Walking, Waterskiing, Wildlife and Refuges, Windsurfing, Zoos, Wildlife Parks, and more. Once you request online booking via the VRBO/VacationRental/HomeAway family we will verify your rates with you at your inquiry time and send you an updated quote if necessary*. We do encourage longer stays with cheaper rates so feel free to inquire about a 4 or 5 night rate if you can't stay the entire week. On the other hand if you want to rent this property for 2 nights and your stay is only a couple months away please ask us for a quote. Please confirm your name, phone numbers whereby we can reach you now and while you are renting, address, check-in and check-out dates, total cost, and number in your group. Rates include Linens, On-site Laundry Facilities, Normal Cleaning, Internet/WiFi, and more. 3 nights or more in-season include bikes if requested at or before check-in. *Call for holiday and other special event pricing. Refundable $300 security/damage deposit due in full with final payment. Need multiple homes-we have 3 on Kent Island and can accommodate up to 34 people between them. BTW…If you haven’t heard from us in 24 hours please call us (Donna 410-984-7618) send us another message or contact VRBO because something is definitely wrong (typos, spam Q’s, wrong numbers, bad email address, etc) Did you see our UTUBE “Kent Island Beach House” video?